If you missed this year’s Grammy awards, you missed more than music. Pink held our attention captive while singing her hit song, “Try”, while flying several feet above the audience’s head. 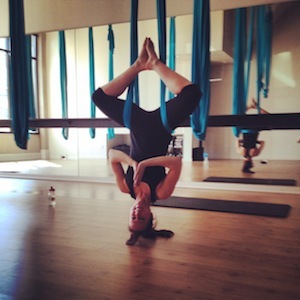 Her amazing voice was matched with her surprising talents in aerial fitness. A new trend, this full-body workout takes your body to new heights both literally and figuratively. 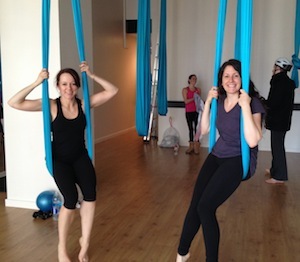 Enter one of Chicago’s hottest workouts, AIR Aerial Fitness. 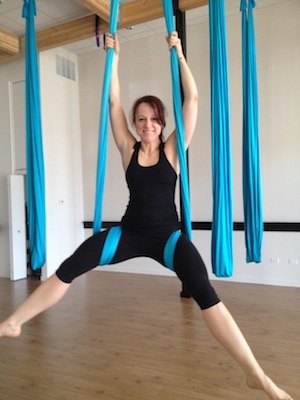 When I first heard of aerial workouts I wondered what kinds of creative exercises the class would consist of. How advanced was it? Would I fall? With all of these questions rolling around in my head, I found not only was it user-friendly but with the way you lever your body into the silk slings, I wasn’t worried about falling. However, this was a whole new breed of exercise! To get my feet wet, I decided to take AIR Foundation. This class is intended to break things down a bit and allow time for instructor form correction. Thankfully, Nicole humored me a bit as I adjusted to being suspended in air, sometimes twirling around in circles until I got the hang of it. We alternated doing heavy arms with heavy legs and even added in some barre moves to allow time to recover. I liked the use of a small air-filled ball, which we placed behind our low backs for some core work. We also took it to the barre for some intense inner and outer thigh ballet moves. Some of my other favorite elements of the class where the tricks. When you first step into the sling and stand up, it’s a little scary. But when you let go of the word “can’t” and allow yourself to try each move, you really start to have fun. Every time I got upside down I got a case of the giggles! One thing that I did not expect was how fatigued my hands and wrists felt. Pulling oneself up in the air requires a lot of upper body strength, but when your grip strength is weak it can be a bit touchy on the hands. However, it’s important to note that this class will definitely help you work on that and there was plenty time to shake out the hands. And being someone who’s tried to lift heavy weights in the weight room and been annoyed my hands can’t keep up, grip strength is essential for more than just AIR. Class was super fun and I really thought the choreography was well-balanced. I left there feeling like I had just gotten done with recess. The “play” aspect of it was great stress-relief, yet I felt completely worked out by the end. I’m eager to try it again!